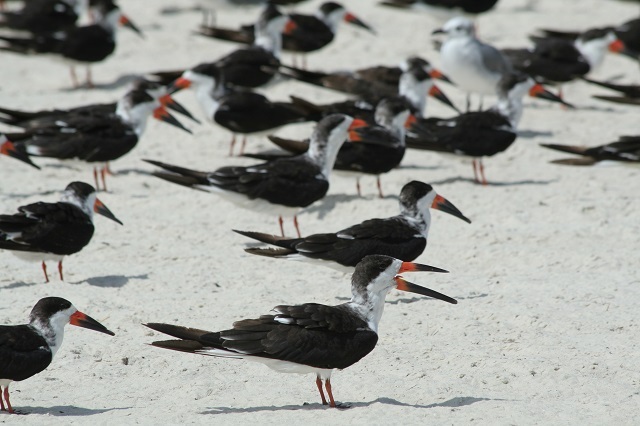 While the cooler months are best at this Citrus County-maintained site, Fort Island Gulf Beach is good anytime for shorebirds along the beachfront. Large flocks of Black Skimmers, terns and gulls loaf on the sandy beach and rock jetty while American Oystercatchers pace the waterline. Atlantic Bottlenose Dolphins are frequently seen here. Marsh Wrens and Clapper Rails can be heard in the salt marsh across the road in the St. Martins Marsh Aquatic Preserve. Watch for cruising Northern Harriers in winter, as well as Ospreys and Bald Eagles overhead. Park amenities include a boat ramp and a 465-foot combination fishing pier/boardwalk (wheelchair accessible) complete with a picnic shelter, shaded deck and benches. There’s also a fairly innovative rack and stack storage for boats that’s been recently installed. It’s certainly quite impressive. The pier provides great views of Crystal Bay. Another wheelchair-accessible boardwalk leads south from the pier through a picturesque hardwood hammock down to the beach. Check the oaks and cedars here for butterflies such as Cloudless Sulphurs, plus resident songbirds and migratory songbirds in spring and fall.